As incredible as it sounds, a man with no legs will be able to compete as a sprinter in the 2008 Olympics. 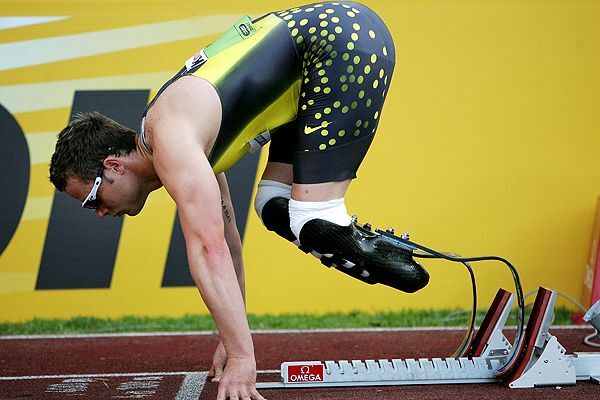 Double-amputee sprinter Oscar Pistorius won his appeal Friday and can compete for a place in the Beijing Olympics. The Court of Arbitration for Sport ruled that the 21-year-old South African is eligible to race against able-bodied athletes, overturning a ban imposed by the International Association of Athletics Federations. More amazing: the opponents argue that he has an unfair advantage. Pistorius appealed to CAS, world sport’s highest tribunal, to overturn a Jan. 14 ruling by the IAAF that banned him from competing. The IAAF said his carbon fiber blades give him a mechanical advantage. It’s hard not to admire Pistorius, who was born without fibulas and had his legs amputated below the knee before his first birthday, and wish him all the best. At the same time, those of us who grew up watching “The Six Million Dollar Man” and its spinoffs can certainly envision a scenario where those with prosthetic limbs do have an advantage over the “able bodied.” And what’s the standard for assessing that? No better than the best human legs ever in existence? Knowing how obsessive competitive athletes can be — survey after survey shows they’re willing to risk losing years of their life if they can win now — we might see the day when someone decides it’s worth it to have perfectly healthy legs amputated.